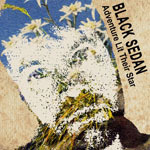 Share the post "Album review: BLACK SEDAN – Adventure Lit Their Star"
A ‘collective’ project ‘orchestrated’ by journalist/author/publisher Mark Hodkinson, sees him bring together five vocalists and upwards of 30 contributing musicians to create an eclectic and challenging record. A bit like walking into an indie record shop and going on a blindfold shopping spree. With Hodkinson pulling the strings, writing, and producing you might expect a themed project but Adventured Lit Their Star is a wide and varied beast. Perhaps most surprisingly is its ambient content. Narration/spoken word also features prominently, which is never a great repeat listening selling point, although it does work superbly well on the opener ‘Love On Love’ which borrows from Charlie Chaplin’s powerful anti-fascism speech from the film The Great Dictator (1940), with a chorus from Nada Surf’s Blonde On Blonde, delivered with suitable vulnerability by Kellie While (better known for her work in folk circles with the likes of Thea Gilmore, Fairport, and Richard Thompson), the perfect counterpoint. ‘If I Could Be Where You Are’ bears many Gallagher/Madchester hallmarks (opening somewhat bizarrely with a Roxy’s Love Is The Drug bass line), ‘Americans In England’ revisits the World War theme (with more narration) and wouldn’t be out of place on an Enigma release, ‘How Do The Dead Come Back, Mother?’ has shades of Frankie / ZTT, and ‘Nurture The Heart (You Say)’ could easily be an early Blue Oyster Cult demo. A melodic take on Robert Calvert’s ‘The Right Stuff’, and ‘This Is Your Captain Speaking: Your Captain Is Alive’ (with yet more narration and a Bowie Heroes vibe) close this incredibly diverse set. In bygone days you would only have found such an eclectic collection on a ‘sampler’ – remember those?